Providing shelter is an important part of being a cat caretaker. For feral cats living outdoors, a warm (or cool) safe shelter can be hard to find. Put your cat shelters out of the way as much as possible, where cats will be least exposed to the elements and other dangers of outdoor living. Most importantly, ensure the cats you care for are spayed or neutered and provide fresh food and water. Download step-by-step plans and measurements for building a cat house. 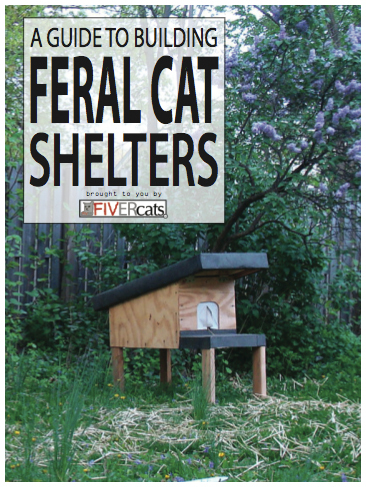 These houses can withstand a variety of environments and provide safe, comfortable shelter for feral or community cats. These houses should be filled with straw for insulation, with a straw changing and cleaning once or twice per year. Watch a FIVER Cats shelter being constructed at super speeds. This video will show you the optimal way to build from our plans. Once you download our free cat shelter schematics, we recommend you watch this video of our plans in action. This fast-motion building session will show you every detail of what it takes to build a FIVER Cats shelter. It will also help you to decide if this construction method is right for you and your ferals. Watch Wheeler and Frank V. as they transform raw plywood and 2x4s into the basic model of a FIVER Cats shelter. As always with our free material, we ask that you share this video and web site with your cat-loving friends. The more people know about the plight of feral cats, the more they are willing to help. Have a look at this video for more information on preparing feral cats for winter. Winter is a tough time for feral cats. Finding fresh, unfrozen water and warmth are big challenges which can also lead to big dangers, as cats sometimes find less-than-safe places to hide and be attracted to certain kinds of anti-freeze. Providing warm and dry accommodations helps keep feral cats as comfortable, safe and healthy as possible in cold temperatures. Providing unfrozen water gives cats much-needed hydration when all other water turns to ice.